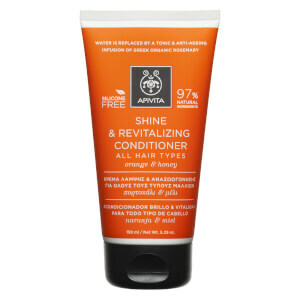 Leave locks sleek and shiny with APIVITA Holistic Hair Care Shine & Revitalising Conditioner for All Hair Types, an intensive treatment that protects against damage. The hydrating formula coats strands root to tip in moisture and essential oils to deliver nutrients without weighing down hair. Vitamins, Greek Honey and Orange help to prevent damage caused by heat styling, working to minimise breakage and split ends to create a soft, silky and healthy head of hair. Aqua (Water)**, Cetyl Alcohol, Hydrogenated Castor Oil Isostearate, Glycerin, Brassicamidopropyl Dimethylamine, Cetyl Esters, Mel (Honey), Olea Europaea (Olive) Fruit Oil*, Citrus Aurantium Dulcis (Orange) Peel Oil, Citrus Limon (Lemon) Peel Oil, Citrus Paradisi (Grapefruit) Peel Oil*, Alpha-Glucan Oligosaccharides, Capryloyl Glycerin/Sebacic Acid Copolymer, Diheptyl Succinate, Niacinamide, Aqua (Water), Aspartic Acid, Tocopheryl Acetate, Panthenol, Hydroxyethylcellulose, Lactic Acid, Sodium Gluconate, Dehydroacetic Acid, Gossypium Herbaceum (Levant cotton) Flower Extract, Rosmarinus Officinalis (Rosemary) Leaf* Extract, Biotin, Lavandula Angustifolia (Lavender) Flower* Extract, Sideritis Syriaca* Extract, Arginine, Parfum (Fragrance), Benzyl Alcohol, Limonene, Linalool, Citronellol, Hexyl Cinnamal.